Yesterday we launched the new Divine Onkar Mission Website. It is packed full of info and I do ask you stop by and take a look. We need your support. We care now working on sorting out online donations and we could really do with some help on that. If you can help or have any suggestions please get in contact either by comments or email. Just want to let everyone know that ALL revenue from advertisments on this blog I will giving over as a donation to Divine Onkar Mission . Jharkhand, the state where all the work Divine Onkar Mission does has been in the news alot of late. Opposition protests have forced India's parliament to adjourn for the fourth straight day after a political row over developments in Jharkhand state. I have given the site a fresh new look and feel. Hope you like it !! My name is Ravi Kumar. I come from Chandrapura. My mother name is Mamta Devi and my father name is Krishna Mali. I have two sisters and 1 brother. I am 10years old. When I was in Chandrapura, my mom used to take me with her to pick through garbage. My father also went to pick through garbage. When I was 6years old, I also started picking through rubbish. Together, I, my mother, and my father used to collect the garbage and sell it and whatever money we got from selling we ran the whole house with it. Our home life was happily passing by. All of a sudden, one day my father got TB, and because of the illness there was an interruption in his work. And because of this I and my 5year old sister also started to go pick through garbage. After selling the garbage, half of the money made was spent on medication for my dad. One night my father died and my mother became a widow. It was my father’s dream that his son get educated and help the world, but he died. My mother wanted me to have an education but she herself was illiterate, she only knew a little reading, that’s why she took me to a hostel in Dhanbad for admission, but I wasn’t allowed, then my mother took me to the Hostel in Gomo but I didn’t get admission there either. Then my mother spoke to my father’s sister. And, my father’s sister told her, “My son Chandan studies at Divine Onkar Mission, so you should also admit your son there.” And my mother brought me to Divine Onkar Mission for admission and I got admitted. And now, I am 10 years old, and I read in Class III. I got 1st position in 6 Examinations. And we have all facilities in this school. In Future, when I will become big I want to become a teacher very much. This is my life story. I am Santosh Kumar. I am in Class 4. 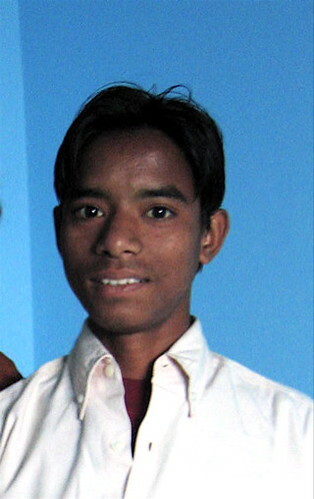 I am 15 years old and I am from Pundag village. My father name is Late Sahal Munda and my Mother name is Srimati Gaalo Devi. I have one brother & one sister. I am the youngest member. I want to be a computer programmer. My father used to work for CCL. When I was 8 years old, my father used to live separately because he had to attend his job.His accommodation was very close to the factory. We used to live with our family (mother, sister, brother and me) in the village, my brother and myself used to attend the village school. When my father got his salary every month he used to visit us. In the village, out of his money all our requirements entire family was leading in very happy life, but he was habitual drinker. He used to drink that much, which was beyond control. Alcohol ruined our happy family. My father was the only earning member in our family. We had to discontinue our study because of poverty. After my fathers death, my mother nominated and recommended somebody for his job, who would look after us. But also he was a rouge and he cheated my mother. What ever she had saved with the bank, he withdrew everything and spent it. My mother started working as a labourer where she was told that Divine Onkar Mission helped children. So she approached the authority. By the grace of God, they accepted me as their student and I registered my name in the hostel school. Ever since I have come here, here I am very happy with everything. Besides academic education. I am learning karate, computers, embroidery and tailoring. The mission is providing everything which is necessary for us free of cost. I would like to say that Drink Wine but not like my father otherwise you will also loose your family. And there will only be darkness in your life. I am very lucky that I got Divine Onkar Mission. aap ka nach ma krishan ki lela samay huhi ha. Bagwan ko manzoo ho tho hum zaldi loot kar aya ga.
Thuub thak - humara pais ha aap ki koobsurat yaad. In your dance I saw the essence of God. Is this simply what life is? Until then we’ve got your beautiful memory. I saw a little heaven. Thanks you God, that you saw us worthy of such treasures. That we may forever work to sustain and flourish your heaven. I got an email from Santosh today. This is a english translation of his personal oath. Most, if not all the children have an oath. 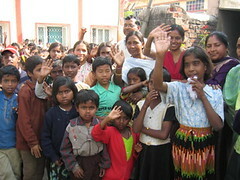 My oath is to help the helpless people and poor children and work to provide them a school education. I will serve like my godfather, godmother and brother ("Bhaiya") Tersam Nagi, Samitri and Amar Nagi to Divine Onkar Mission. My name is kajal kumari. My father name is Sri Sitaram Sahu. My mother's name is late Mrs Parvati Devi. I have a younger sister. My father always hate me. We are very poor. My father always beat me. One day my younger sister and I were going to my grandmother's house. That night my papa hung my mother and killed her. Next morning we started to search for my mom. When I asked my maternal grandmother where my mum is she told me all different things. We both were orphaned. My father then admitted me here to get an education. After some time my father sold my younger sister. I am very happy here. I have no any problem here. Here I get many love that i expected of my home. I am Manila. I am reading in class IX. I have been living in Divine Onkar Mission since 1998. I come from Chutupalu Pundag. It is 30km from my School. I have three Sisters and no Brothers. I am youngest in my family. Name of sisters are late Charki Devi, Mrs.Ugani Devi and Mrs.Asha Devi. My father’s name is late Mr.Ram Munda and my mother’s name is Mrs.Jhalo Devi. I was born on 6th March 1990 at Pundag Village. I belong to very poor family. When I was baby, at first my family was happy. My first sister (Charki Devi) was married. Then my father downed in a pond. The pond is near the village. We had tried to search for my Papa but we could not succeed. After one week we found the dead body of my Papa in the pond. The cremation was on the shoulders of my mummy and sisters. That time I was very innocent and did not know the effect of sorrow of my family. After of my Papa’s funeral ceremony my mother went to work. When I was five years old , I used to go to a primary school for my study. My childhood dream was to study in a hostel. My two elder sisters were married with the help of my eldest sister. Then my eldest sister was no more in this world. She died on 7th May 2003. She had three sons. They then lived in our house. My mother looked after them. On 4th Oct 1998 I came in this hostel by help of Rajesh Bhaiya. At first I was very sad because I was not with my family but now I am very happy because my childhood dream has completed. I want to be a lady doctor. Beside academic education I have learned that every man has some social responsibility. I have taken an oath in future when I become an earning member then I would not ignore the poor people. Certainly I will do my best so that they also feel comfortable. My name is Pawan Kumar. I am a student of Class IX (9). I am 14 years old. I come from a village called Ichatu. My father’s name is late Shri Damru Mahto and my mother’s name is late Shrimati Dumri Devi. They are not living with me. They are no more in this world. I have four brothers and four sisters. I am the 7th member of my family. When my parents were alive, we were leading a happy life. Then I was very young. When my mother was suffering from fever. My father could do nothing, my mother’s became very serious. After that my father admitted my mother in to Hazaribagh Hospital and after a few days my mother became all right. She came home. Then she died all of a sudden. After that my father started drinking. My father got married again. Due to our step mother my father’s attitude towards us changed completely. She used to beat us without any reason. She would care for her child only. She never used to give us food. All she was interested in was to get us to do the various domestic jobs. We had to take the cow and goat to the forest for their food and collect woods for cooking purposes. Whatever our step mother saved our father would spend up to the last penny by drinking. My step mother was also suffering from fever. Soon she was unable to walk. She was treated many times but she was not cured. She became mad. In that situation a Divine Onkar Mission Hospital representative happened to visit our village. They felt pity by seeing the horrible condition of my stepmother. They were kind enough to admit her into the Hospital. My mother died in the hospital after some time father also died. I belong to a poor family. The family management was taken over by my elder brother. However, he could not provide us every thing but he used to love us. He had heard of the mission. He approached the authority and by the grace of God. I was accepted as a boarding student in the Onkar School. Like me there are about two hundred students here getting free education. We pray together daily for a long, peaceful and happy life. Besides academic education I have also learned that every man has some social responsibility. I have taken an oath that in the future when I became an earning member, I will not ignore the poor people. Certainly, I will do my best so that they also feel comfortable. I have recently spoken to the children and asked if they could tell me about their backgrounds in their own words. I hope it will give you an insight into the background of the children. I will blog them as soon as I receive them. I am sure you will enjoy reading them. Please do comment on the blogs as I am sure the children will get a thrill reading your feedback. On another note Tersam arrives back on the 6th Feb. I hoping to setup an audio and written interview. I will provide details nearer the time. As promised here is Kumlaish's and Ramesh's thoughts about their trip. I would like to thank them for sharing their thoughts. 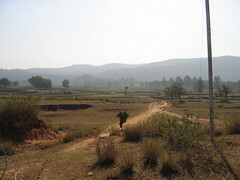 Our visit to DOM in Jharkhand had been on our wish list for several years. This year we decided to shift our priorities and planned to undertake the visit on a tight time scale of two weeks. It just felt like, now was the right time for us. Although we had been involved with DOM since its onset and knew of the many projects and seen video footage of them. However, nothing could have prepared us for the most emotionally moving experience of our lives. On our arrival we were welcomed with an orderly seated sea of smiling faces. We felt immense pleasure and joy to see everyone, and knew we had indeed arrived. 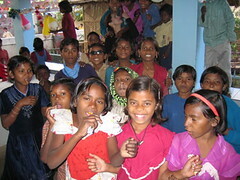 We shared sweets with the children and staff and felt that our small gift was inadequate, in the face of so much love. The atmosphere felt as though it was charged with unconditional love and trust. The children behaved as if they knew us and addressed us as didi (sister) and jija ji (brother-in-law) we felt like we were their family returning form abroad, although we had never met them in person before. The setting is beautiful and exudes a calm, disciplined and vibrant atmosphere. No child moans about having to do chores or study, in fact you are always greeted with a smile. From early dawn to dusk everyone is involved in purposeful activity. Able body children spontaneously help less able colleagues, at time the response for support is intuitive, as though they are forever watchful of the needs of others. We had the pleasure and privilege to participate in a picnic outing to celebrate the New Year. The organisation was excellent and a real tribute to Rajesh, who appeared to have organised it without any visible effort, which we are sure, is our illusion. Everyone from all the different schools and projects attended and thoroughly enjoyed the day, some children and adults danced with shear abandonment for the majority of the time. Witnessing capacity for joy this was a humbling experience for us, as we could not remember the last time we enjoyed ourselves with so much unreserved pleasure. It was a day which we will never forget, our senses were overloaded with the sights and sounds and the memories will be with us forever. There is just so much that is needed to be done there, e.g. teaching material, updated teaching skills, behavioural programme, and psychological support, career coaching, but most importantly what is needed is love and commitment. We have come back with our minds buzzing with all sorts of ideas of what could be done, the only problem is time and our commitment to work and family here. Our worldview has changed forever, our values are now all topsy turvy, nothing means the same any more. We in England have so much to offer if only we could make time and space. God willing, we will return soon and visit our family in Jharkhand. We were told today that an 18 year old girl and then a little later a 40 year old man have been taken in. The girl had been badly abused and was just left outside. The man had been run over by a truck and is urgent need of an operation. I will do another update once I have more detail. We have been regular contact with the everyone at the school and hospital. We talk on the phone, email and now Instant message. I have had a flu and cold since I have been back thanks to the current UK weather. We are currently putting together a package to send the childreen, I have printed over 200 photos and produced a dvd of their Christmas show. The new website design for Divine Onkar is going well. I should be updating the site in the next 2 weeks. Kumlaish together with Ramesh spent 2 weeks at the hospital and school. I have asked them if would submit a post describing their experiences to which they have agreed. They arrived a week after we did and got back to the UK on 8th Jan 2005. They visited a school for children with disablities which we never got time to visit. It will very interesting to read their point of view. New Years Day was the best I have ever had. At around 4am were awoken by loud music. It was the start of the celebrations and homes all around were starting the day with prayers and songs. Once that stopped our room was stormed by the children wishing us a happy new year. It was quite obvious that we were not going to get any sleep :-). We jumped out of bed and were called up to the roof terrace. There we watched the sunrise. It was simply awesome. The mood was alittle somber, the children had started to ask if we were really leaving today, they were visibly upset. After breakfast I joined a few of kids downstairs and we watched an episode of "Lost" on my laptop. Monica and I then started packing; we were ready for our one and half hour drive to Ranchi's Birsa Mundan Airport. All the staff and children had gathered at the front of the building to see us off. There were many last minute photos to take which seem to take forever as some of the kids were crying and needed consoling. "We will be back at the end of the year, and this time it will be for alot longer" we told them, those words didn’t really help much. The children had got used to visitors that they got attached to never returning. It was awful having to get into the car to leave while the kids were upset. I promised them I would send them copies of all the photos I had taken during my visit, something in the region of 700 pics, and countless hours of video. We hated to leave and would have done anything to have stayed longer. How I wish I was like Barbara. She was a new volunteer that had sold simply everything she had in the UK. She often said everything she has in the world is in her room. She is staying out in India for at least 2years. Two weeks was simply not enough time to do much of what we wanted. The trip to the airport was not enjoyable at all. I knew we would miss everything about the place, the good and the bad. It was very hard saying goodbye to everyone. 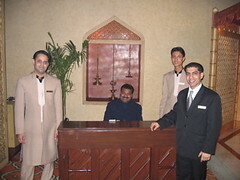 We felt as though so much was missing when we arrived in Delhi that evening. We felt even worse when got back to the UK. For the cynics it was not the "holiday blues", we were never on a holiday, we just missed the work, people and life. This trip has put my life in the UK into perspective. Like many people I have been looking for that something in my life but could never find it. I have always thought it was something material, a better home or job. When I got those things it was never enough. This time I think I have found it or I am at least on the right road and in the right place. 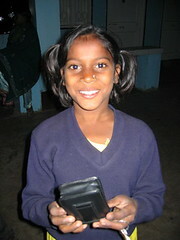 My trip to India has changed my life forever; I feel it inside and out. What possibly could a place without any of the comforts we are used have to offer? I don’t think that I could genuinely answer that yet, but whatever it is I felt it. There were times I found myself saying I could do this work forever. I have never said that about anything else, nothing has ever come close. It’s a chance to make a real difference in this world. I have never wanted to just marry, have kids, live the rat race and then die. It’s not enough for me and I know it is not enough for many people. I have experienced many things over these 2 weeks and I am still piecing it together in my head, I know one thing that I am going to be part of this project for the rest of my life and cannot recommend this experience enough to others. The founder of the whole project, my dad, Tersam. He has set 3 schools, 1 hostpital, eye camps, educational camps, water wells, leprosy aid, housing, schools in Orissa, aid to Orissa and Gujarat. There are so many dimensions to the project I am finding out new things all the time. 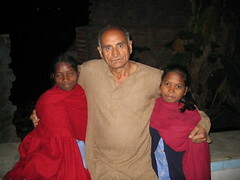 He always talks about how it was the poverty that forced him to leave India 50 years ago. Thats why he came back to do what he could to fight poverty. Through his and my mothers determination, sarafices and vision they have changed the direction and path of future generations of my family and many families around the world. I am and will be forever thankful and grateful. For the handful of children that have family, visits are normally once a week for about a hour. 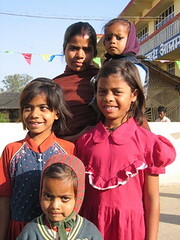 This photo is of Kiren and Veerus (right to left middle row) with their mother and 2 sisters. Always at my side everywhere I go. It is New Years Eve and our last night here. I have also been in bed since yesterday afternoon suffering from a fever and exhaustion. The picnic yesterday was fantastic, just great atmosphere. Watching 500 plus children walking the 3km to a clear flat area in the middle of a jungle was a site to see. The landscape was breathtaking, mountains all around with a stream passing by. There truly is so much beauty in India. There was lots to do, cricket, football, walking, dancing, eating and hiking. Afterwards we all walked back together. The children spoke more freely and we talked about how our worlds differed. Many told me we may see a elephant on the way home unfortenatly we didnt. Tonight is our last night. Many of children are getting upset, especially the younger ones. We are not looking forward to leaving tomorrow. The children are already upset and keep asking us not to go. Here News Years celebrations start on early morning on News Years Day. Around 9pm I spoke with a few of the older children and we talked about what they did before here. It was funny cause they said they use to sleep around 8pm as they is no electricity in their village. When I told them in England we have electricity but at night people switch off the lights and light candles to relax we all laughed. Things have been really hectic and busy. We have been organising aid for the Tsunami victims. A delgation is flying from here to Chennai tomorrow to organise further help and setup camps. The kids are very upset as a group of people from their karate class who live in Ranchi have been reported missing. They had flown south to attend a martial arts competition. It is devasting, I would really like to extend my trip and fly with the group to Chennai but I am unable to. From the phone calls we have been recieving it is just major chaos there. The kids did a special prayer for the victims. Since my last post I filmed 10 cataract operations which was an unbelievable experience. The surgeon talked me through every stage. We interviewed one the patients who I had followed since the camp. The story of their hardship was very hard to listen to and film. Christmas day was fun. The children all decorated the school and they designated me to blow the balloons. It is bizarre how you change here. In England I don't make friends easily and usually keep my distance here I have made more friends than I have in a lifetime. You totally reassess your life here and what's important. Some days you can meet some totally stupid people, like the meeting we had with to men that decided to fence one of the schools with barbwire. The mentality here is very hard to digest at times. PTA meetings in schools turn into political fiasco. But I have to say it is rewarding. You are fighting a battle everyday, sometimes it feels pointless but you soon feel that at least you in the fight and not sitting in the sidelines. Back to Christmas day, the kids all did a show, dances, comedy sketches, carol singing and a nativity play. Then at the end the kids wanted me and Monica to sing. Not likely so we made a sharp exit with a very quick speech. I have found a company in the local town that will print off all the digital photos I have taken. We are gonna make a collage and put them on the wall in dorm corridor. I've also taken some family pics of the those kids that have some family. It would will be really nice to give the photos to the children for them to keep has they have nothing else. I went to Ranchi yesterday. What a nightmare. The roads here are crazy. You have trucks, motorbikes, cars, rickshaws, bikes, cows, goats, chickens, dogs and people to look out for, all at once. It is congested beyond belief, no law and order visible at all. It sometimes feels like everyone is escaping a nuclear holocaust by any means. By the way no one wears a helmet and sometimes there about 4 on a single motorbike. Kids are perched on the front handlebars. Well where else would you put them? They would rather pay the fine for not wearing a helmet than buy a helmet as the fine is cheaper. What amazing logic. Tomorrow there is a big outing for all 3 schools. We are going on a picnic with 500+ kids. Today I am doing jobs around the school. Thursday we went to a remote village to setup a medical eye camp. The village is in the middle of a large coal mining quarry. It was like we had landed on a different planet. You can forget about pollution control here. People were just burning off coal everywhere. There was thick black smoke and black dust rising in all directions. I even saw a pig that was originally pink but now was covered in black coal dust. I couldn't believe there were people living in this total mess. How exactly were villages surviving here? The purpose of the camp is find patients that are in need of a cataract operation or in need of medication for eye ailments. Some of the visitors to the camp had been partially or fully blind for many years and needed less than a hour operation to remove the cataract. Sadly there were a few people who had waited too long and were too late for a successful operation. It was heart wrenching watching while they were told the news. Monica was involved in taking blood pressures and explaining the operation to patients. I was surprised to see some people refuse the operation and medication, this is mainly due to the fact they are just not comfortable with having an operation. There is alot of fear in these people. I finished filming and went to the car to get my still camera, I looked in the opposite direction of the camp and saw a big pool of water. The water was of course very dirty but I could see that there was one person washing their clothes, one washing his pots and another having a bath. I went over with my camera and filmed it. 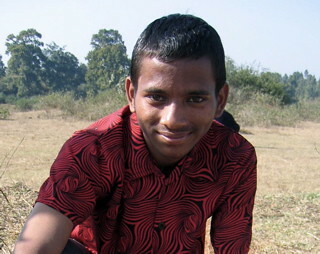 Many of the villagers started to gather which is usually the case when they see a camera. They were living in such extreme poverty. I was told that they sometimes used the water for drinking too. I cant help but ask how we has the human race can call ourselves advanced when there are people in the world that cannot drink clean water. 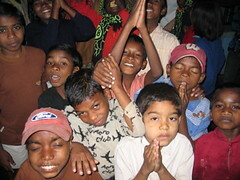 Later on in the evening the kids asked me and Monica if we would attend their evening prayers. We said yes, it would only be a few minutes we thought, we were wrong :-). First it took ages to get to our seats as the when were walked in we were mobbed. Then when they started the prayers and songs, they just went on and on and on. They had decided to do the long versions as we were attending. It was so funny cause after each gap I would lift my head thinking its all over and then they would start another song. Then one of the teachers said thankyou to us and told the children we would say a few words. There was no way I could speak in whole sentences so Monica said a few very quick words. I then met 3 students who are really into computers. I spoke them about team work and the qualities of a good computer professional. Their minds are like sponges they pick up things very fast. I will teaching a computer class tomorrow on relational databases. Its been a while since I have posted, its been really busy, and the electricity seems to switch off when I get time to post. Here is a big post. Had a difficult time sleeping last night, I am eating mainly spicy food which my stomach cannot handle very well. It was very cold night and I had got a small fever, I was fine in the morning though. We decided to explore today. I walked around the building complex getting myself familiar with everything. I went to the hospital and sat with a few patients, then I walked around the school and kitchens and said hi to a few of the staff. Their work is manual and so hard. The ovens are coal fires and they make the kids meals all day long. They live on the premises as do many of the staff and teachers. Many if not all of the staff have horrific pasts, they also were very weary of me. I have always smiled and said hello and cracked a joke or two, I don't think they know what I am saying but all the same I a smile. (I know many people here humor me). Some of the staff have children that attend the school. I was outside near the classrooms and I could hear giggling and I looked up and all the kids that we in class had got up to look out the window and were waving and calling me. It is clear we have to be careful when walking around as to not disrupt classes. We are hearing more and more horror stories and it is pretty clear that there is a great need for counseling here for the children. I will post a small history of one the children in my future posts. He is 4-years old. He has a huge scar on the side of his head. This was caused by his violent father beating him with a stone over and over. He was found in a rubbish tip and was left for dead. It was touch and go for him as to whether he would survive. He got better but then school have had fair problems in getting him to adjust due to his violent behavior towards other children. 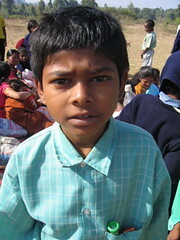 He is much better now and is doing well at the school. He is shy but he has got attached to Monica. Firstly I helped interview a person who came looking for a job. He was heavily involved in Human Rights an various charity causes. You have to be very careful in India as the person you are interviewing might not be who he says he is. There was something not right about this guy so we did not take it any further. We then travelled a few miles to the farm which has been setup to give fresh produce to the school for meal times. On the farm there were two cows and a new calve which was born the day we arrived in Delhi. What a great experience, we picked fresh fruit and veg and then sat in the sun eating some of it and chatting. It is a lovely day. I also met the computer teacher. He does not seem to know as much as he should and has asked me to help. I am will be sitting in on his lesson on Thursday. He was found working at the a hotel nearby. He is 4 years old. He doesn't know who is parents are, his older brother still works at the hotel. Today a lorry carry clothes imported from the UK was going to arrive. First I was filming the weekly free doctor service in the hospital. I was sat in consultation room with the doctor. He seemed like a very nice guy but did like to look at himself being filmed. There is such a fascination here with cameras of any sort. There were a few problems at the surgery when I arrived as people have a difficult time queuing here, also the queuing patients kept creeping closer and closer to the consultation room. Before you knew it the queue started inside the doctors room. I said a few words to the doctor and he asked the nurse to move everyone out as there was no privacy. I brought sweets down for the children that were seeing the doctor. A child of only a month old came in. The doctor checked her and told me she has a mumour in the heart and would need an operation. He called me over to listen to her heart through his stethoscope. Heartbreaking as the mother looked visibly distressed when she was told her child could not be made better with just medication. The doctor did reassure her that her daughter would get better. He told me that most of the problems come from poor water quality. There are many complaints of abdominal problems. It was a great experience to seeing people benefiting medical care who would otherwise not have any, some were traveling up to 3 hours to the hospital. Tibi came in with her younger brother bleeding and badly beaten and bruised. A guy brought them in and said he had seen them in the street and thought he should bring them. The school kept Tibi but her brother did not survive from his injuries. At first she would not speak but once she did she began to tell how the guy who brought them in was her father and that he had beaten them so the school would accept them. He had warned them not tell school he was her father. What kind of pathetic human being would do a thing like that. What can I say to truly describe into words what I've experienced in the last 24 hours. I am speechless. I've probably seen and experienced more in the last 24 hours that I have in 34 years. We finally got to Ranchi, the flight was ok besides the ever so small incident of the passenger's mass exodus to the toilets while the plane was hurtling down the runway about to take off. Not a good idea, they obviously weren't paying attention to the saftey demonstration. The drive from the airport to Ranchi was madness. We were picked up by Mum and Dad, Kittu and friends. It was hilarious, the driving, if you can call it that. It had me firmly on the edge of my site. It is an understatement to say there is no highway code. I lost count of the amount of cows we had to wait for while they crossed the, well you couldn't always call it a road. So many rich colors and smiling faces, but alot of poverty. Then Kittu pulled up outside a street vendors store. He asked me to look at the owner. I cant explain what I saw but to give you an idea he was the exact twin of the elephant man and thats is no exaggeration. I was embarrassed to say I was completely gobsmacked, for almost a minute I could believe what I was seeing. I am due to go back there to meet him and see if we can help. He told Kittu before that he has alot of people come look at him but no one helps him. I will update you more on him on my future posts. When we reached the School and Hospital it was surprisingly quiet, we said hi to all the staff and Family who were there with roses to greet us. Dad asked me to follow him and then WOW ! all the 300+kids were sitting in front me and Monica. They all stood up and said hello. It was breathtaking and ever so embarrassing. Who are we to receive such a greeting? It was unlike any show I have played at, so overwhelming. After saying hi to each and every one of them we went to unpack and to catch our breath. 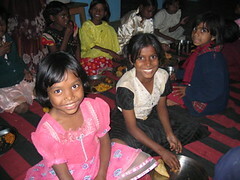 Words cannot describe the kids so I am posting photos that I took during our evening meal. I just sat in the middle of all the kids with a camera and it was unreal. I would take a photo and show them. They soon cottoned on and were grouping up with friends so I would take a photo. Love is a free emotion here, they don't want anything else from you but that. I have made so many friends who's face light up when you walk near. They love to just hold your hand. So many faces I had seen only on video and photos before now. Mum and dad are full of life. Dad is in his own world and wants to show me everything this very second. He is so happy, I have not seen him like this ever. I am totally taken by the amount of work he has done and his dedication. I also ask the question what we would have turned out like had he never left the country to give us a better life. Something that is so clear to me now. So little here but so many laughing faces. The principal has told us only to speak in English as he wants them to practice and get a true experience. That gets me off the hook cause my hindi is as good as my japanese. Its not a good feeling when a 5 year old asks why I dont speak properly :-). I am on a dial up account for internet access so will post as often as I can. Also the electricity is as bad told me it was maybe worse. Dad is keeping me busy and any free time I have I end up having 30 kids walk in to drag me off to play. Everyone needs to do this at some point. Earlier rather than later. 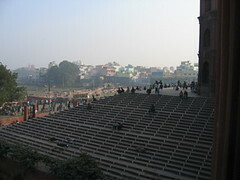 The view @ Jama Masjid showing "Old Delhi"
The day started with being setup upon outside the hotel gate by a bunch of doggy nasty smelly taxi men. All we wanted to do was go for a walk. In the end with the walk lasting about 3 minutes or 4 paces. 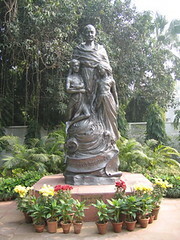 We then hired a driver from the hotel for the day and set off to firstly see the Gandhi museum, "Tees January Marg". It was surreal being at the same place where Gandhi lived and worked and was later assassinated. A life changing experience as I have followed his work so much for many years. We then travelled to "old delhi" to see Red Fort and Jama Masjid which are old Moghul buildings built in the 1600's by Shah Jahan (the guy behind Taj Mahal). Beauty has new meaning thats all I can say. "Old Delhi" is a very different place, it is very poor with shanty towns. Very upsetting to see. We then spent some time at Rajghat, Gandhi's memorial with eternal flame. Such a peaceful relaxing place. We then went on to see Anzal Plaza which is an American style mall, we shouldn't have bothered it was really crap, but we got the chance to get the driver a Mcdonalds so he was happy. Such a big divine between the people you have and the people you dont have. Enough of the city and the luxury we're flying to Ranchi tomorrow morning. Another story on the news. 2 ladies have got married in Amritsar in Punjab. Whats the problem? they married each other. Their parents, can you beleive, and the locals have complained and demonstrated and have asked the law to intervene but alas they cannot as there is no actual law to prohibit it. As camouflage one dresses as a man and they ride a motor bike around town. They stressed if they are seperated they will commit sucide. Problem is one of them was engaged to a man at the time. Jerry Springer could move his show here I reckon. We arrived ok and on time. We were greeted in customs with a queue which must have been a mile long, ok I lie about 500yards. Saw some cows and donkeys walk past outside the airport which was fun. The driver from the The Taj Hotel was well cool, he gave us a quick tour of the area around the hotel. We are next to India Gate and the Presidential Palace. They are amazing, so much beauty. The hotel is awesome, we are so impressed. 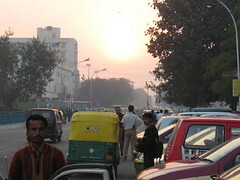 We booked in and then took a driver to Connaught Place which is like a central shopping area. Its not far from the hotel. It was an experience I can tell you that. I am already speaking in a very strong indian accent :-). There's so much to take in - the colors, scenic areas and then the poverty and beggers. We weren't hassled too much but it is still very harrowing to see what looks like 14 year old girl with a child begging for money. We ate an aloo tikka burger from mcDonalds, it had to be done, and it was awful, not recommended at all. A funny story I will leave you with. The news reported major delays at Mumbai Airport. The reason why? Someone has nicked, yes nicked the ILS landing beacons from the one of the runways. This is what aircraft use to locate and land the plane on the runnway. I am not surprised as when I looked out of the window during taxing at Delhi Airport I saw a bunch of kids on the runnway playing. A whole new world. I have setup this blog to document my upcoming visit to Ranchi in India. 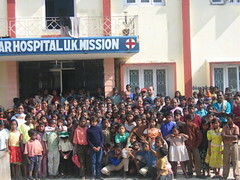 I will be spending 2 weeks working at the Divine Onkar Hospital and Orphanage. 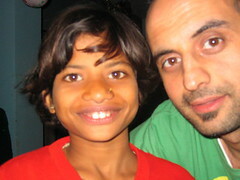 I fly out on 16th December to Delhi and then fly on to Ranchi where the Hospital and Orphanage on Sunday 19th December. If you want to find out more about the Divine Onkar Project then goto http://www.divine-onkar.org.uk/ (I do warn you their site is going through a transformation) They are doing great work out there and overcoming great obstacles. Due to the location I may not always have internet access, hell I might not have electricity all the time but rest assured I will try my best to keep you all up to date and will include some pics as often as I can. Please do leave comments and feedback. To do so just click the comments link below and then click post comment.